It is the start of my little blog break so I can enjoy Spring Break and a visit from my Dad. My blog friends really stepped up to help me out with guest posts - I am so blessed! Please give them lots of comment love! My fabulous friend Kim blogs at Homesteaders Heart. You shouldn't expect any canning or pioneer posts over there. Her blog is a light-hearted look at the real life of a homemaking, home schooling, rather competitive, slightly OCD, super silly, kind mom! She hosts Friday Funnies and Show & Tell Saturdays. And I'm sure she would like for you to know that she is my Top Commentator - LOL! Kim likes tea, too, and has a wonderful Tea For Two-sday post to share with you. For this edition of Lisa's Tea for Two-sday I wanted to do a little tea review on some new tea I bought. I always make it a point to stop in the aisle where they have all the wonderful teas and just kind of stand there perusing it all. There is always something new to find. 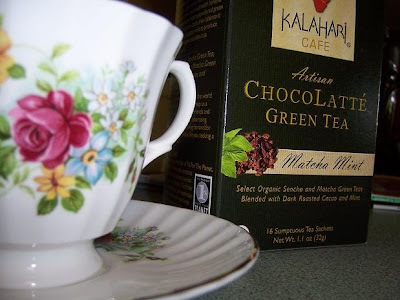 A couple of weeks ago I stumbled across Kalahari Cafe Artisan Chocolatte' Green Tea Matcha Mint. Phew that's a mouthful. I wasn't real sure at first if I wanted to give it a try. I usually can't picture chocolate with tea but I threw caution to the wind and bought it. Let me tell you I am some glad I did. As soon as you open the little package the tea bag is in, the aroma just permeates the air. It smells soooooo good. I know sometimes I've gotten tea that smells good but tastes awful but not the case with this. It tasted wonderful. They say you can add milk to it but I like all my tea plain. I like to taste the tea and all it's pungent flavors. 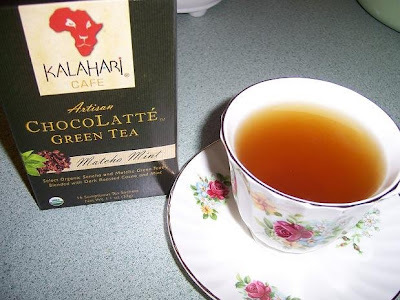 This tea has a very minty flavor with chocolate undertones. I highly recommend it. On another note. Do you like the tea cup that my new found tea is in? I had written on my blog about my first tea cup that was given to me by a wonderful friend of mine and how I really don't like buying my own, hence the reason I only had one! LOL. But my husband was at someone's house to buy a mosquito killer ( that's another story entirely ) and the people had just had a garage sale the weekend before and they had their leftovers sitting in the garage and this tea cup was still there. Can you believe that? It's beautiful and without a chip. Here's the best part. He only paid a dollar for it!!! Can you say SCORE!!! So I officially have 2 tea cups in my collection. I can now invite one of you over for tea. Who wants to be first? Hee! Hee! Hee! I'm first to comment on my own post! LOL. Thank you for the wonderful and very accurate introduction my friend! LOL. My post looks good on your blog. I hope you enjoy your time off and your time with your Daddy. Big Substitute Posting Hugs to you my sweet friend. Maybe I'll steal a reader or two from ya! LOL. Just kidding! Well sort of! Hee! Hee! Is chai tea allowed to make the cut? I am a huge fan of Oregon Chai Vanilla chai tea latte mix. It comes in pouches, and one box costs what one cup would at one of those fancy-schmancy coffee places that I love so much, but try to visit sparingly. My friend got me hooked on them. I like to drink it from a glass mug, and sometimes I even put a huge pile of whipped cream on it. I love traditional tea, too, but sometimes I just need that chai. I love your teacup! I just found one at a thrift store for a quarter. Not one thing wrong with it! I may bring myself to use it at some point, but right now, I have it on display. Sounds delicious! I've gotten a chocolate tea before. Loved it! But I agree with Kim. I don't like milk in my tea. Take care Lisa! I hope you're enjoying your week!